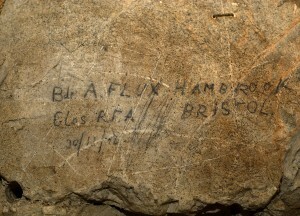 I have been researching certain members of this family after I spotted some graffiti of a Great War soldier, Bombardier Alfred Flux from Hambrook, whilst exploring caves under the church in Bouzincourt on the Somme in May last year. 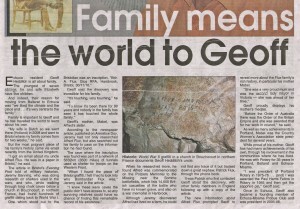 Whilst the caves were covered in graffiti from soldiers from all over the world I was intrigued by this local man and endeavoured to find out more about him. Full details of this can be found on the newspaper link below as the story was featured in the Armistice Day editions of the Bristol Evening Post, Western Daily Press and Bath Chronicle. 832011 Corporal Alfred Ernest Flux, serving with “Y” 61st Trench Mortar Battery, Royal Field Artillery was killed on 21 March 1918, aged 25. 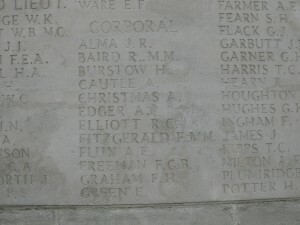 He was the son of Alfred William and Emily Flux, of Walton Farm, Hambrook, Bristol and is commemorated on the Pozières Memorial to the Missing. Alfred had served in 1916 in the Laventie area with involvement in the Battle of Fromelles on 19/20 July 1916 and stayed in this sector until his Division moved south to the Somme in mid-November 1916. The war diary says they were billeted in caves under Bouzincourt Church on 28 November and the graffiti is dated 30 November. The Battery stayed at Bouzincourt until January 1917 and then they went back for rest. February 1917 saw a move to Harbonnieres, south of the River Somme until May 1917. By June 1917 the battery was near Arras and then moved up to the Ypres sector where they were employed as stretcher bearers for the 38th (Welsh) Division in the Canal Bank sector on the first say of the Third Battle of Ypres (Passchendaele). They stayed in the salient until September when they moved back down to the Arras front, holding the dreaded Chemical Works and Greenland Hill sectors for the next two and half months. They then moved down to the Somme area and in January 1918 were ensconced in the Holnon Wood sector west of St Quentin. It was whilst holding these positions against the German Spring Offensive on 21 March 1918 that Alfred Flux was killed. Since the article being released I have been in further touch with members of the Flux family, notably Judith Pike (who lives in Bristol) and Geoff Hedditch from Echuca, Victoria in Australia. 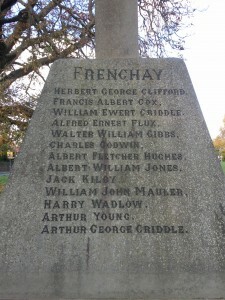 I had done a fair bit of research into the family so knew that Alfred was one of a family of five children but Judith explained that Alfred’s younger brother, Francis Charles (but known as Charlie until his death at the ripe old age of 86 years) had also served as an artilleryman in the Great War. I volunteered to find out as much of his service as I could and was able to produce a detailed report for the family. Luckily, Charlie’s service record had survived and so I could piece together his service with 47 Brigade, RFA and then various Trench Mortar Batteries of the 19th Division. Other than suffering from dysentery in 1915 he appears to have been unwounded and was demobbed in February 1919. I was delighted to receive some post this morning from Geoff Hedditch in Australia. Enclosed in the envelope was a copy of his local newspaper, the Riverine Herald, which included an article about Geoff and his delight at the work I had done. I would like to thank Patrick, Judith and Geoff (all members of the Flux family) and Alan Freke and his fine colleagues at Frenchay Village Museum for their help. It just goes to show what a spark of interest coupled with a bit of determination can achieve – quite amazing that this story could travel all the way to Australia. Please also remember the Flux boys themselves – Alfred and Charlie – who both answered their country’s call when needed and who, for one, paid the ultimate price. This entry was posted on Friday, January 14th, 2011 at 3:11 pm	and is filed under Miscellany, News from the front, Research. You can follow any responses to this entry through the RSS 2.0 feed. You can leave a response, or trackback from your own site. Another nice piece and shows how some detailed and diligent research can pay handsome rewards. Good to get some good news from Australia after all they’ve been through recently.